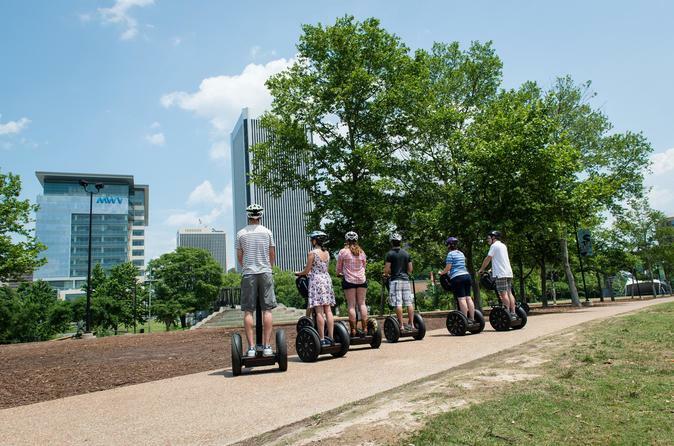 Our 2-Hour Richmond Landmark Segway tour will explore interesting and notable sites in and around the great city of Richmond Virginia. On the 2-hour Shockoe Bottom tour, you will see many sites of national importance in this historic area Richmond. Among others, some of the sites seen on this tour are the Edgar Allen Poe Museum, the Holocaust Museum, the site of the 17th St train crash. Your small group will also witness the Richmond Slavery Reconciliation Statue, which is one of 3 statues on three separate continents. The other statues are located in city of Liverpool England and the Republic of Benin, each of which played a prominent role in the slave trade. Then we will zip on over to Triple Crossing, which is the only place in the world where three train tracks cross at the same point. Then we take you to Lumpkins Jail, a slave jail recently excavated, known as the "Devil's half acre", and the site of extreme cruelty during the Civil War, as well as the monument to Henry "Box" Brown, and the 17th Street Farmer's Market. History runs deep in Richmond and these sites must be seen and the stories told!